The Civic Integrated Motor Assist (IMA) Hybrid System is based on an electric motor mounted between the engine and the transmission. This motor assists with extra torque which considerably reduces the vehicle’s pollution levels. 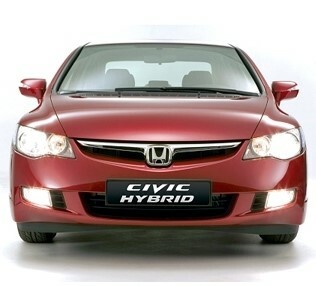 The Civic Hybrid Technology recovers and transforms the energy that is lost during deceleration and braking. 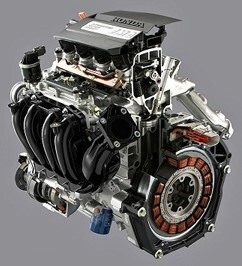 This technology stores the electric power in order to assist the engine when electric power is required. It should be noted that the engine uses two ignition coils per cylinder, as well as the variable distribution system VTEC. The electric motor works at 158V 3-phase AC, and it is used to start the engine and also as a generator that charges the battery. That is to say, the electric motor acts as a starter motor and an alternator. The 158V battery is formed by 20 modules of 6 cells, each one connected in series. Each cells voltage is 1.32V. In contrast to its competitor the Toyota Prius, the Honda Civic cannot launch from standstill using only the electric motor. The use of the engine is needed to launch the car. the vehicle speed needs to be between 20 km/h and 50 km/h (12 mph and 31 mph). In this case the system will decide if it requires assistance from the engine in accordance with feedback from the accelerator pedal. In contrast to the Toyota Prius, the petrol engine does not stop turning while the car is driving. The system is additionally provided with a 12 volt battery which is recharged by a converter located next to the inverter. 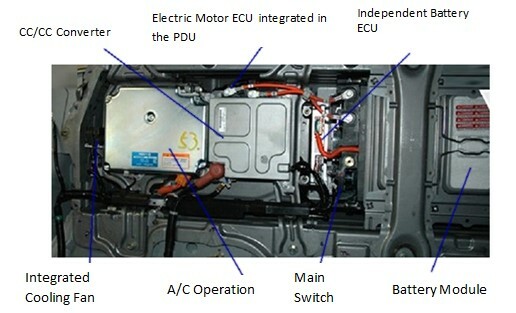 The converter-inverter assembly is cooled by an electric fan in order to avoid overheating problems. In some models there is an additional alternator to provide the charging for this battery in the case of a failure. During the startup, the engine is started by the electric motor. From then on, depending on the battery charge condition and the torque delivery need, this electric motor assists the engine to a greater or lesser extent. It is under high load accelerations (e.g. in ascending slopes) when the electric motor delivers maximum assistance. When driving at constant speed, the assistance level that the electric motor provides the engine depends on the battery charge condition. When driving at high speed and with a low charged battery, the electric motor recharges the battery instead of assisting it. During deceleration, the electric power is used to recharge the battery depending on its condition. In case you have to carry out maintenance or repair work on the high-voltage circuit system, it is very important to turn the main battery switch on and place it to the “off” position. In this way, we disconnect the high voltage supply over the complete circuit. All safety precautions set out by the manufacturer should be referred to before conducting any repair work on this vehicle.